Clarets midfielder Joey Barton has responded to news of his 18-month FA suspension. "The FA have announced I am banned from all football for 18 months and fined £30,000 and costs for offences against The FA’s Betting Rules. I am very disappointed at the harshness of the sanction. The decision effectively forces me into an early retirement from playing football. To be clear from the outset here this is not match fixing and at no point in any of this is my integrity in question. "I accept that I broke the rules governing professional footballers, but I do feel the penalty is heavier than it might be for other less controversial players. I have fought addiction to gambling and provided the FA with a medical report about my problem. I’m disappointed it wasn’t taken into proper consideration. I think if the FA is truly serious about tackling the culture of gambling in football, it needs to look at its own dependence on the gambling companies, their role in football and in sports broadcasting, rather than just blaming the players who place a bet. "I am not alone in football in having a problem with gambling. I grew up in an environment where betting was and still is part of the culture. From as early as I can remember my family let me have my own pools coupon, and older members of the family would place bets for me on big races like the Grand National. To this day, I rarely compete at anything without there being something at stake. Whether that’s a round of golf with friends for a few pounds, or a game of darts in the training ground for who makes the tea, I love competing. I love winning. I am also addicted to that. It is also the case that professional football has long had a betting culture, and I have been in the sport all my adult life. "Given the money in the game, and the explosion in betting on sport, I understand why the rules have been strengthened, and I also accept that I have been in breach of them. I accept too that the FA has to be seen to lead on this issue. But surely they need to accept there is a huge clash between their rules and the culture that surrounds the modern game, where anyone who watches follows football on TV or in the stadia is bombarded by marketing, advertising and sponsorship by betting companies, and where much of the coverage now, on Sky for example, is intertwined with the broadcasters’ own gambling interests. "That all means this is not an easy environment in which to try to stop gambling, or even to encourage people within the sport that betting is wrong. It is like asking a recovering alcoholic to spend all his time in a pub or a brewery. If the FA is serious about tackling gambling I would urge it to reconsider its own dependence on the gambling industry. I say that knowing that every time I pull on my team’s shirt, I am advertising a betting company. "I say none of this to justify myself. But I do want to explain that sometimes these issues are more complicated than they seem. "As for the scale of my football betting, since 2004, on a Betfair account held in my own name, registered at my home address and verified by my own passport, with full transparency, I have placed over 15,000 bets across a whole range of sports. Just over 1,200 were placed on football and subject to the charges against me. The average bet was just over £150, many were for only a few pounds. "For the modern footballer, downtime and rest are important and I spend much of my time away from training in front of a TV screen, channel hopping across a range of sports, and betting on the outcome of games. I like watching sports and predicting the outcome. Set alongside what we are privileged to earn as footballers, my betting stakes are relatively small. Betting for me, is less about how much money I win or lose, and more about whether I can correctly predict the outcome of the game I’m watching. I hate losing more than I like winning, and this mindset has helped prevent me from placing big bets, for fear of losing big. "Raised at the hearing was that between 2004 and 2011 I placed a handful of bets on my own team to lose matches. I accept of course that this is against the rules, for the obvious reason that a player with an additional financial stake in the game might seek to change the course of it for his own personal gain. However I’d like to offer some context. "First, in every game I have played, I have given everything. I’m confident that anyone who has ever seen me play, or played with or against me, will confirm that to be the case. I am more aware than anyone that I have character issues that I struggle with, and my addictive personality is one of them, but I am a devoted and dedicated professional who has always given my all on the pitch. "Second, on the few occasions where I placed a bet on my own team to lose, I was not involved in the match day squad for any of those games. I did not play. I was not even on the bench. I had no more ability to influence the outcome than had I been betting on darts, snooker, or a cricket match in the West Indies. I should add that on some of those occasions, my placing of the bet on my own team to lose was an expression of my anger and frustration at not being picked or being unable to play. I understand people will think that is childish and selfish and I cannot disagree with that. "Third, I should point out that the last of these bets against my own team was six years ago (and in a reserve game), when I was going through a particularly troubled period, and when the FA were not nearly as hard on gambling as they are now. "One thing I can state with absolute certainty – I have never placed a bet against my own team when in a position to influence the game, and I am pleased that in all of the interviews with the FA, and at the hearing, my integrity on that point has never been in question. I could not live with myself, nor face my team-mates or the fans of the clubs I played for, if they seriously thought I would bet on my team to lose a game whose outcome I could influence. "The Commission that heard my case made clear in their reasons on a number of occasions that “there was no suggestion [I] was involved in match fixing” and I am publishing a list of my bets because I want the full facts of my case to be known. "A ban of 18 months is longer than several bans handed to players who played in matches where they bet for their team to lose and – unlike me – were found to have had an ability to influence the games. The only players to be banned for 12 months or longer bet against their own teams and played in the matches in which they placed those bets. Players who did not play in the matches they placed the bets in have never been banned for longer than 6 months. I feel the ban is excessive in this context. "Throughout my career I am someone who has made mistakes and owned up to those mistakes and tried to learn from them. I intend to do that here. I accept that this is one more mess I got into because of my own behaviour. This episode has brought home to me that just as I had to face up to the need to get help to deal with alcohol abuse, and with anger, so now I need to get help for my issues with gambling, and I will do so. 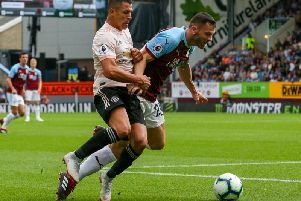 "I want to thank the Burnley FC board, management, players and staff for their faith and understanding, and their belief that I would play for them, and play well, even with this hanging over me, and I want to thank the Burnley fans for the support they have given me throughout. They have been brilliant. "Having consulted with my friends and lawyers, I have decided I will be appealing against the length of the ban. I hope that I shall be afforded a fair hearing by an independent Appeal Panel. If I am, we are confident that the sanction will be reduced to a fair one that both reflects the offences as well as the mitigating factors and the fact that there was nothing untoward or suspicious about the bets I made."